Grip It is a quick and easy pattern for a handy zippered briefcase (a see-through carrying case with handle). The finished size is 16 1/2" x 11 1/2". 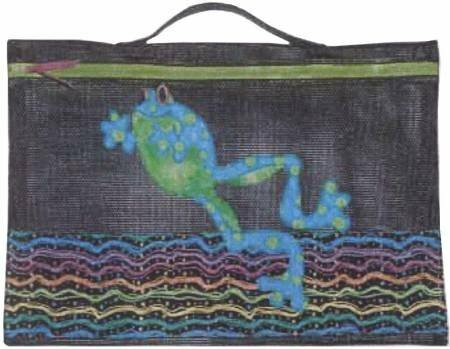 Frog appliqué is included. Models shown are made using vinyl coated polyester mesh/pet screen that is available in most hardware stores. Make yourself a briefcase for supplies, papers, sewing & quilting projects...or for the office. Express your artistic style and attitude. Customize the embellishments and fabrics to make one-of-a-kind gifts for friends and loved ones. Or, make a fabulous bag for special toys to use on outings with grandchildren.